Well actually, this was a Friday vase, which was deconstructed and transported 150-odd miles as a bunch of blooms for my Mum during our weekend visit. It’s pinks and greens this week, as my container-grown Achillea was ready to pick, along with the first of my Sweetpeas from the allotment and Astrantia from the border. I’ve added some deep green in the form of unripe Allium seedheads. I deliberately chose some highly-fragranced sweetpeas to add to my plot this year (Painted Lady and Spanish Dancer) and they really do smell fab. The Achillea has a nice scent too, and it’s much more intensely coloured than the photo on the garden centre tag gave it credit for. 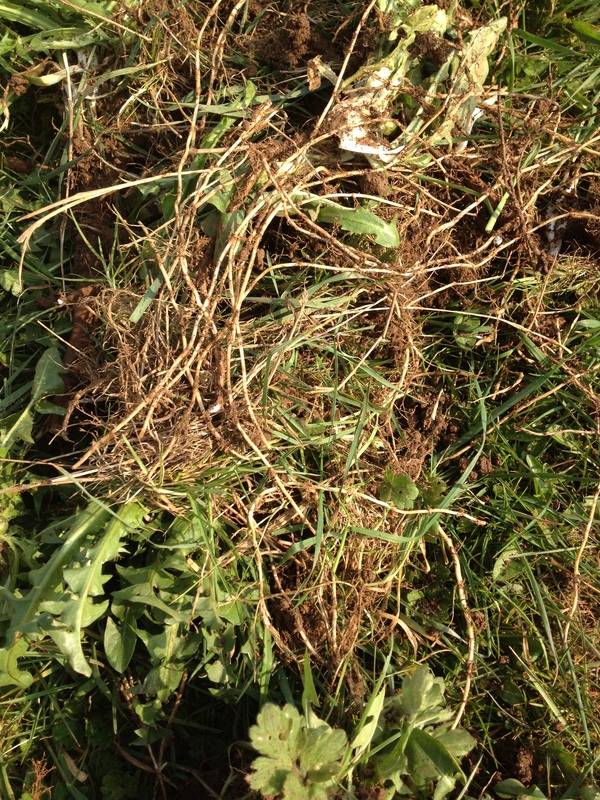 The ‘scent’ from the Astrantia, however, is absolutely rancid! Is this one of those smells that is sensed differently according to your genetics? Do some people like it?? For me, it’s definitely not a flower to use too much of indoors, and probably needs to be outgunned by strongly scented choices. My cut flower patch has almost been exhausted by this weekly feature. 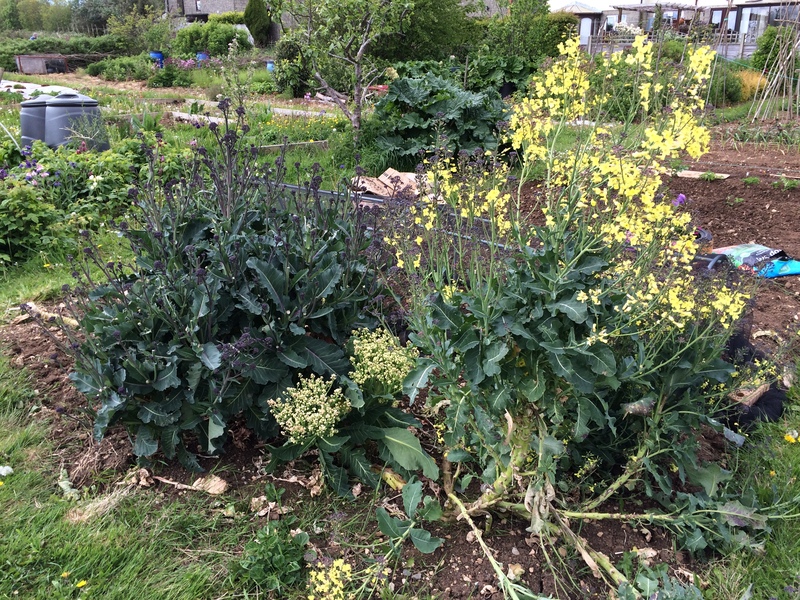 I’ll have to add more varieties next year if I want to keep taking part. 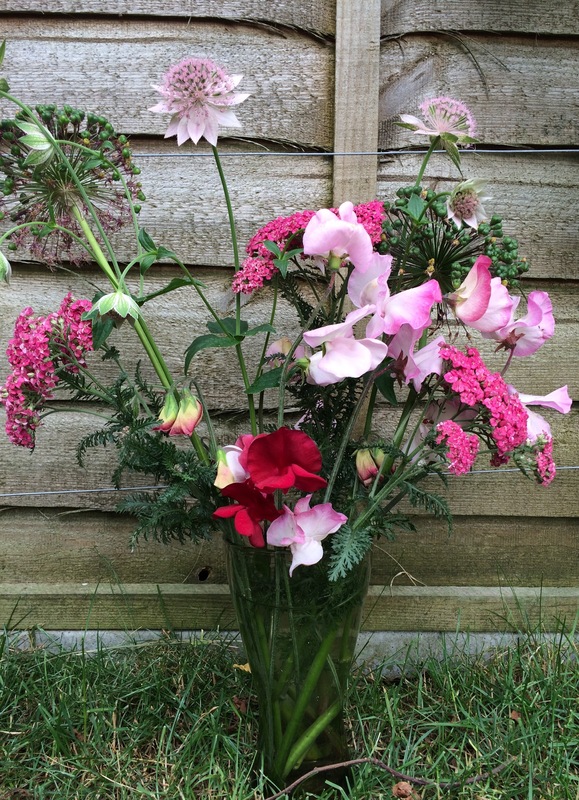 In a Vase on a Monday is run by lovely blogger Rambling in the Garden. Join in! 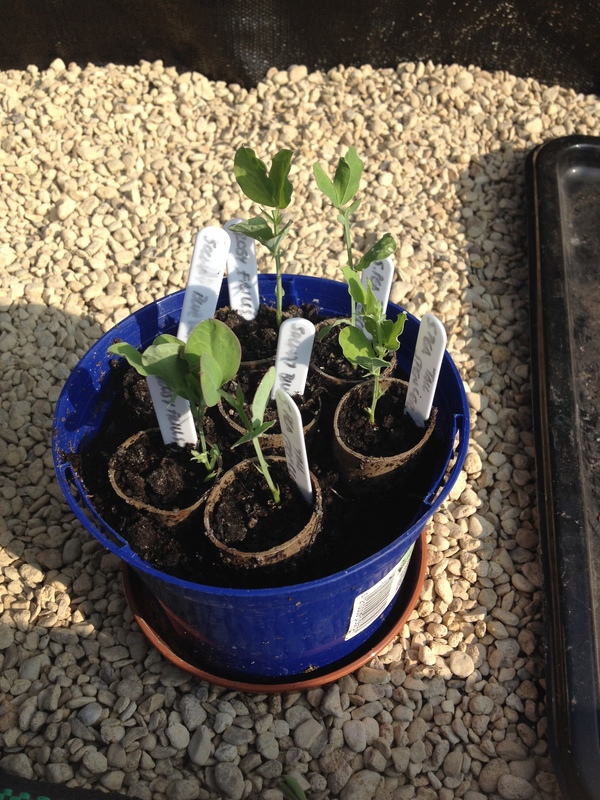 Planting sweet peas. Part 1. 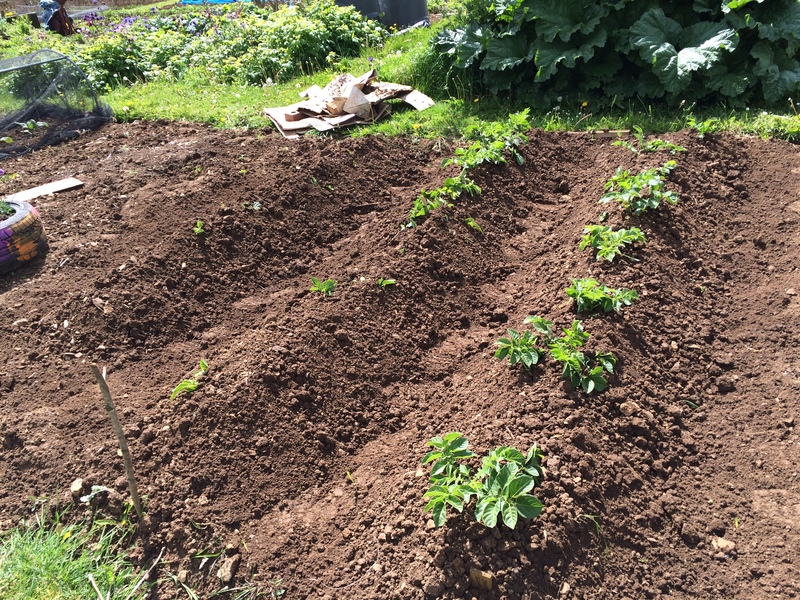 Today was the first I’ve had in ages when I could hit the allotment with more than a glancing blow. We’ve had a run of beautiful sunny and warm days here. 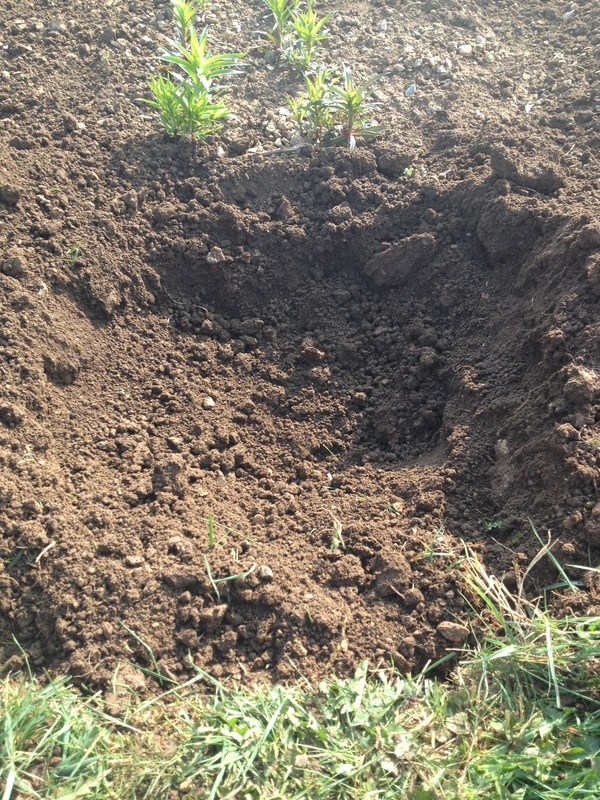 It’s put a spring in everyone’s step and I feel like we’re closer than a gnat’s whisker to getting loads of stuff in the ground. 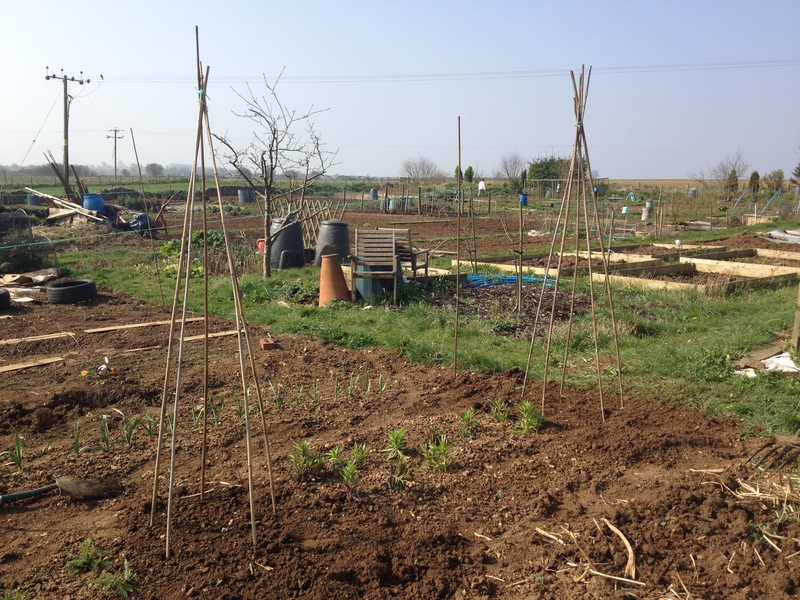 I’ve made an allotment plan, but there are still some details to iron out – like where to put the sweetpeas. Sweet Peas are lovely to grow; pretty, prolific, great for cut flowers. I had thought about mixing them in with my climbing French beans, but then I noticed some convenient gaps in my little cut flower patch. 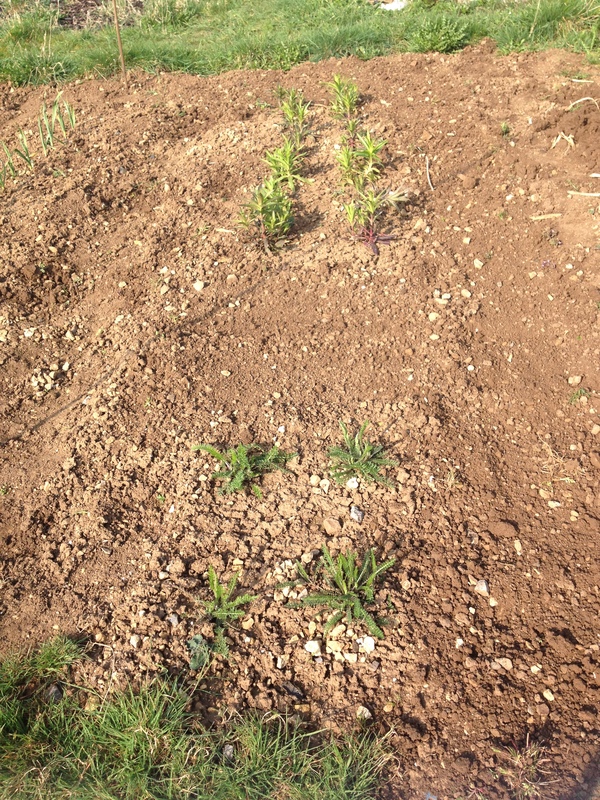 The flower patch currently contains sweet williams and achillea cassis, shortly to be joined by a sowing of nigella. It used to have echinacea too, but these seem to be irresistable to critters and were quickly munched. 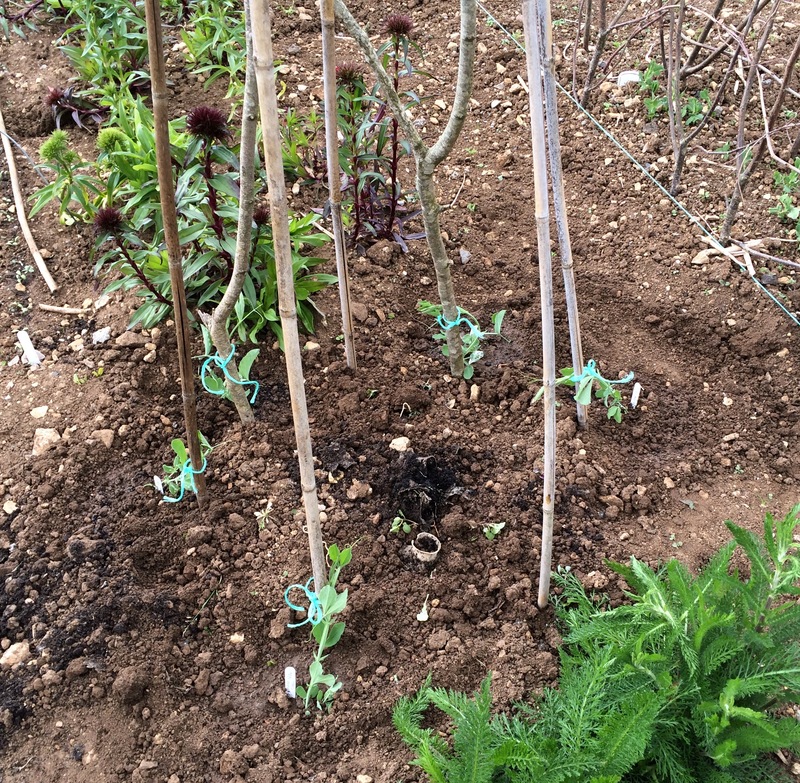 The echinacea-sized gaps looked just right for sweet pea wigwams. 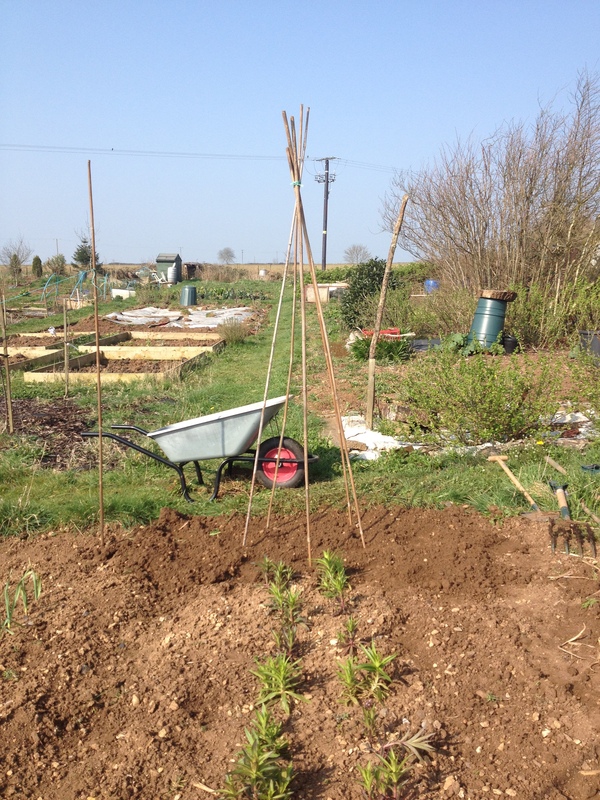 I put up a second wigwam too, completing all the steps the same, except finding bindweed roots instead. Gah! 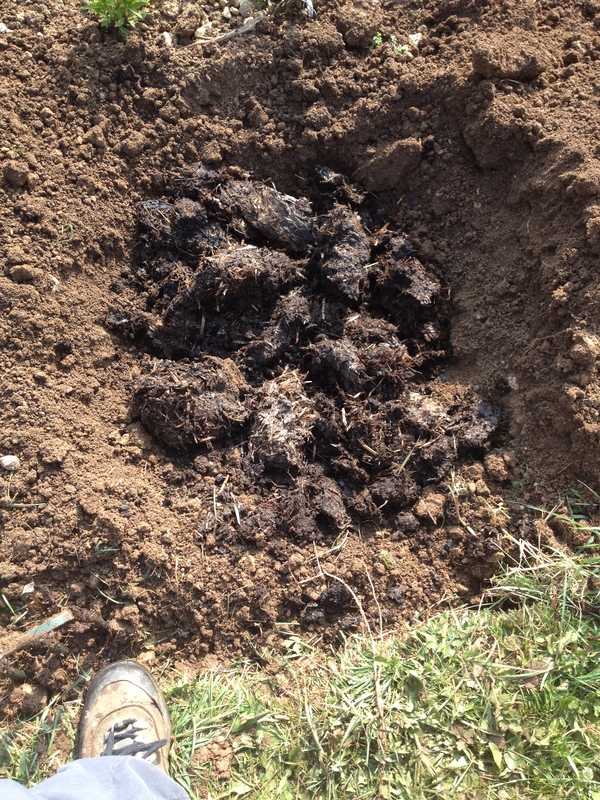 The RHS recommend adding manure at least 4 weeks before planting. I’m not sure I’ll wait quite that long, it depends how the seedlings get on and what the weather’s like. 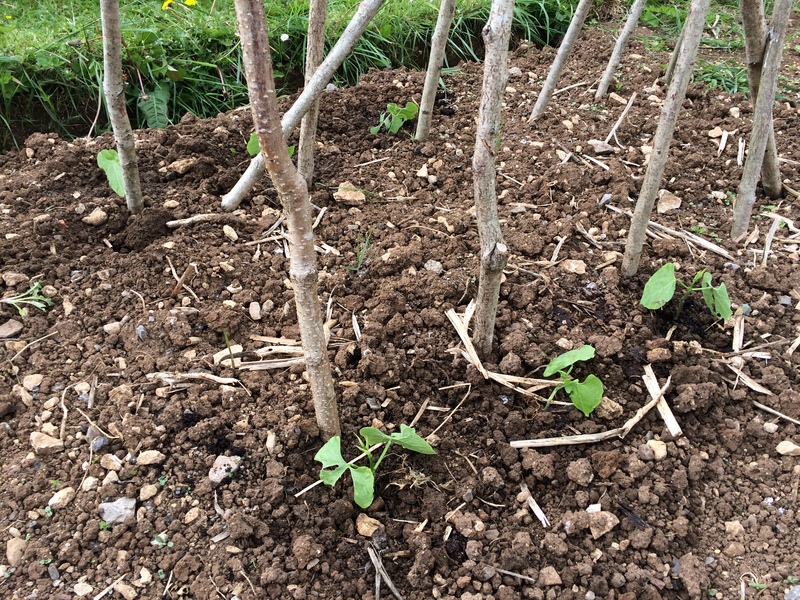 The first sowing – with the exception of no-shows from the Solway Blue Vein – is looking good. I’ve pinched out the tips to make them branch out, and they look strong and healthy. 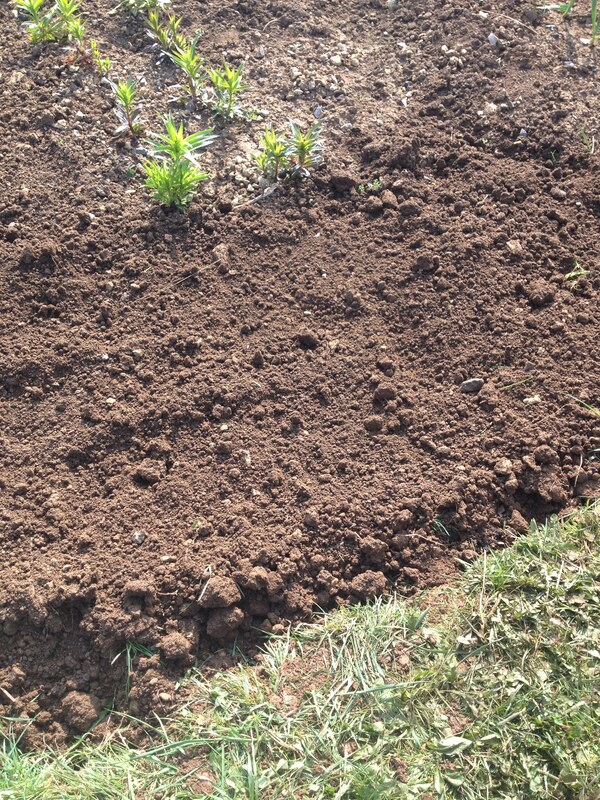 And the second sowing are all up. 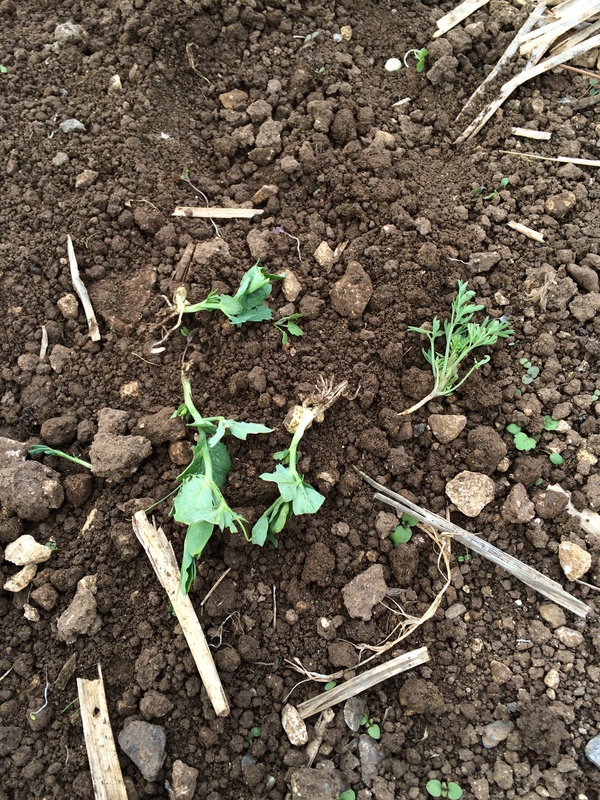 First sweet pea sowing looking good.